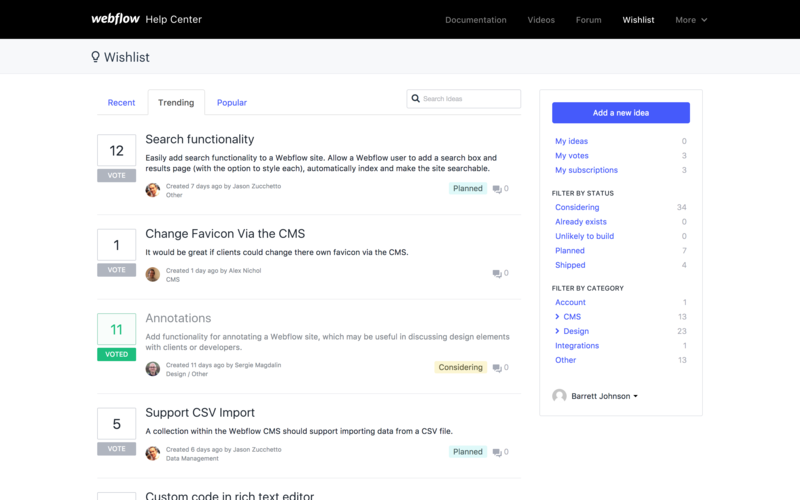 Introducing the Webflow Wishlist, where you can easily request new features, vote on others’ ideas, and both influence and get a better sense of what we’ll build next. Building a product roadmap that’s driven by the community and aligned with Webflow’s internal goals isn’t easy. Our community has grown tremendously over the past few years (now over 500,000 Webflow users! 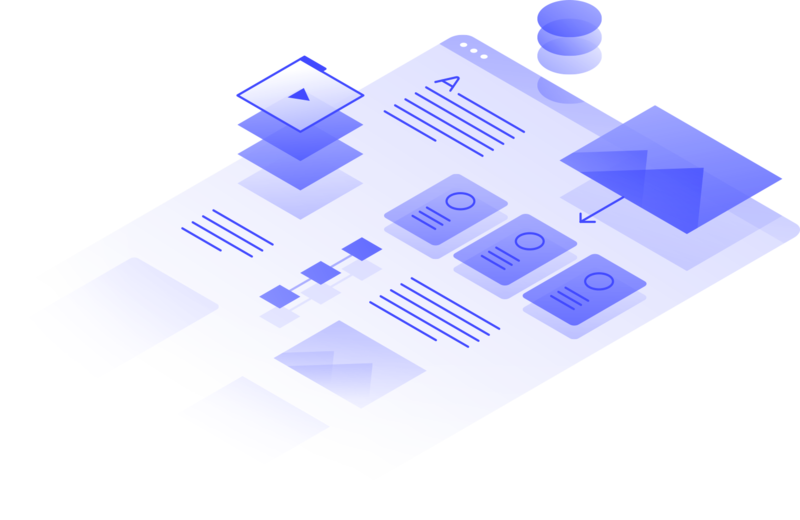 ), and with that growth comes an increasing number of uses for Webflow: building full production sites, prototyping sites, various CMS use cases, building animations and interactions, and various use cases for creating forms, to name just a few. The first step in building a community-powered product roadmap required organizing all of our community’s input. Community input includes a wide range of communication channels, such as forums, support tickets, social media, and emails. With open source software, this problem becomes a little easier: “Here’s the Github/Jira/etc. issue, please vote for it.” But without a public issue-tracking system like this, every employee must remember to duplicate customer issues as internal tracking issues, which quickly falls apart as both the number of employees grows and the number of customers increases. Internally, this has created a huge backlog of Github issues, Helpscout tickets, Asana tasks, etc., that have been increasingly hard to keep track of. At the same time, the Wish List category on our forum has grown dramatically in the past few years, to the point that we’ve decided we need a better, more centralized, and more organized system to track and collect feature requests, find and merge duplicates, and provide timely feedback. 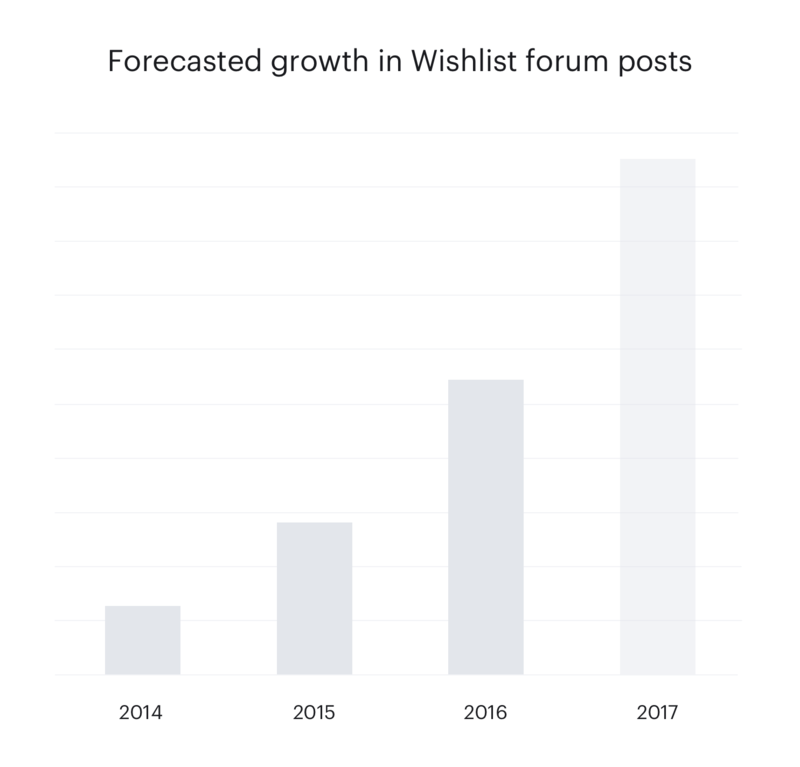 ‍Forum "Wish List" posts are growing beyond a manageable scale. 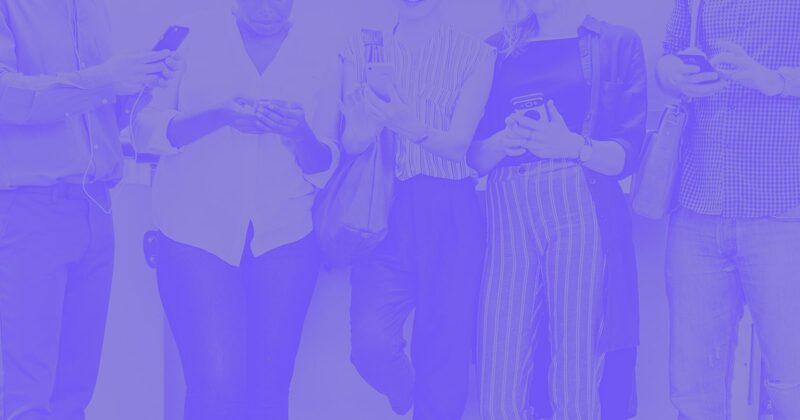 With the growth in forums posts for Webflow feature requests, it has become increasingly difficult to provide timely responses, find and merge duplicates, and generally keep up with the volume of messages. To give you a more direct way to vote on and make feature requests, keep these requests better organized, and to make it clearer to our community what we’re working on, we’re phasing out our forum wish list category in favor of a new, community-driven wishlist website. We’ve started migrating some of the top requests from the forum to the new wishlist site, and will be pointing existing forum threads to their corresponding wishlist threads over the coming days. In the meantime, we invite you all to check it out and vote for the features you want most, or propose new ideas. It’s integrated with your Webflow account login, so you won’t need to create a new account — just use your existing Webflow account. Voting and threading will keep the new Wishlist site much more organized. The Webflow Wishlist is now our source of truth for all communication channels: support tickets, Twitter/other social media, emails, and so on. Many customers have asked us to create a public Webflow roadmap. While it’s often hard for us to describe exactly what the development team is working on (such as refactoring projects), our public wishlist site gives us a few ways to describe feature requests we’re actively working on or considering. As requests are added to the wishlist, we’ll be tagging them with one of the following labels, which will help you understand where they fall within our development and planning timeline. 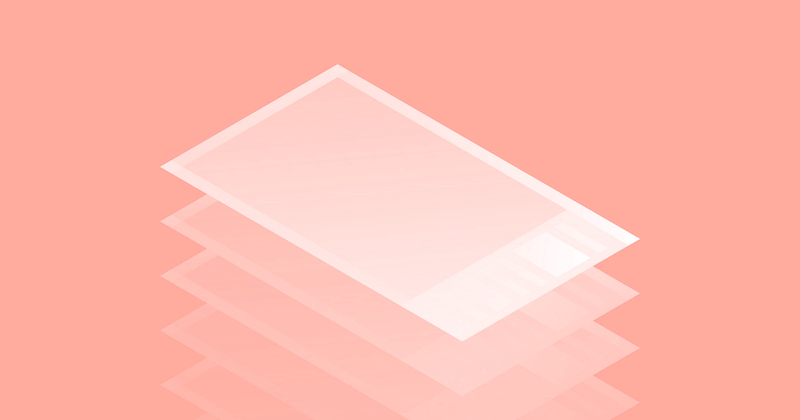 Webflow has an incredible community of supporters, and we hope our wishlist site will be the first of many improvements we’ll make to bring more transparency to our development process. As with any project, the Wishlist will continue to be a work-in-progress, but we’re certain it’ll improve our ability to communicate our roadmap to you, as well as your ability to influence that roadmap. Former product manager @Webflow. Follow me @jasonzuketo.